A recent study has shown how quickly germs can spread through a classroom from just two 'contaminated' students, in a matter of hours--and it all started at the water fountain. 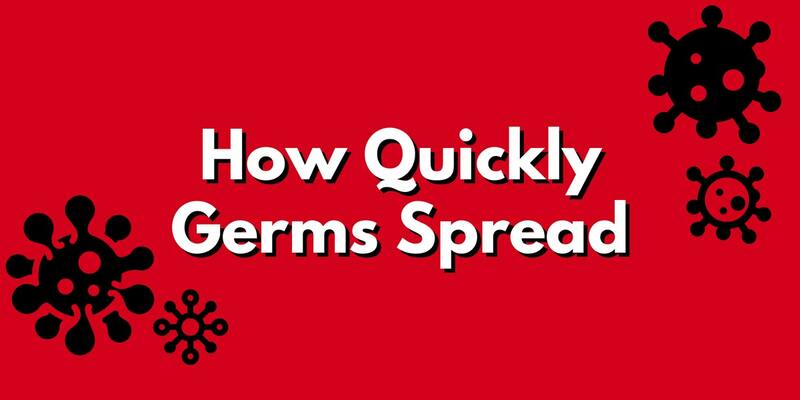 How Quickly Do Germs Spread in a Building? Previous studies have shown that a single contaminated person can spread germs throughout an office, and to several individuals, within a matter of hours. While this is a demonstrable case in favor of enforcing handwashing practices, given the influenza virus can survive for 48 hours on a hard non-porous surface, the study also underscores the importance of regular cleaning and disinfection services to prevent the spread of germs from hot spot surfaces to hands and our eyes, nose, or mouths. Unknowing to the entire class, two students participated by allowing the application of a powder to their hands that was only detectable by blacklight. Those students were told to go about their day as normal. A few hours later a blacklight was used to illuminate the kids and various surfaces throughout the classroom. The findings showed the "germs" were everywhere, including on eight other students (out of the 26), desks and chairs. Where do we Stand in the Current Flu Season? The 2018-19 flu season is well underway, typically peaking between December and February, with 19 states reporting high rates of infection and, while nowhere near the epidemic numbers from the previous season, approximately 7 million people U.S. have already been reported as infected. [...] the Centers for Disease Control and Prevention (CDC) reported that almost 6 percent of patient samples sent to the lab from Sept. 30 through December have been flu-positive. For the last week of December, the total was more than 13 percent. Flu rates usually peak in the U.S. between December and February. Most states are currently reporting low to moderate flu activity, although 19 states are seeing higher levels. This season, however, deaths from flu and pneumonia, are not at epidemic levels as they were last year. The current number U.S. deaths per week associated with the flu is around 40. The single best method for combatting the spread of germs in classrooms or the workplace is to combine regular hand washing with routine infection control and cleaning services. While that may sound easy, studies have shown hand washing compliance is down around the 50-60% range for school-age students, with adults coming in slightly higher, at between 64-70ish percent. Increasing handwashing compliance in schools and offices, just once per day, could significantly reduce absenteeism by approximately 50%. Several studies have demonstrated that appropriate hand hygiene can significantly reduce illness and absenteeism from school due to gastro-intestinal or respiratory illness. One intervention with scheduled opportunities for cleaning hands throughout the school day produced as much as a 50 percent reduction in absences. While implmenting a manual intervention in classrooms, requiring students to wash their hands once per day, which should be relatively straight forward, enforcement in the workplace is another challenge altogether. Clear instructions on posters in the restroom regarding correct hand washing techniques, as well as the potential consequences for failing to adhere to these practices. Regular cleaning of the restroom. Germs spread quickly and are often present in individuals who do not realize they are contagious due to a lack of symptoms. Viruses, such as influenza, can remain stable and contagious on a person's hands for several hours, and hot spot surfaces for several days. To halt the spread and end the needless and costly cycle of illness and death, everyone must do their part. That means occupants must step up their compliance regarding their own personal hygiene while facilities and offices managers, as well as school adminstrators, must do everything within their power to ensure the buildings they are responsible for are professionally cleaned with high-quality products on a regular basis. If you would like to learn more about the vital role custodial and facilities services play in germ prevention and infection control, or the cost-saving benefits of outsourcing your organization's janitorial services--contact us today for a free quote!